Children's and Family Portrait Photography in Healdsburg, California. Just Added - Petite Sessions! In case you haven't heard, we just added petite sessions to our booking page! Typically available on Friday evenings, petite sessions are 20 minute sessions perfect for a family photo refresh or milestone session. For more information, head over to our investment page. 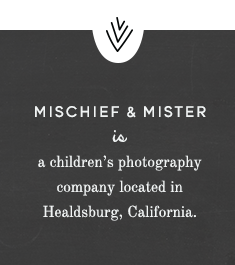 Mischief & Mister is a whimsical children’s and family portrait photographer based in Healdsburg, California. We serve Sonoma County, Napa County, Marin County, San Francisco and the Bay Area. We offer family, newborn, maternity, and children’s portrait photography.